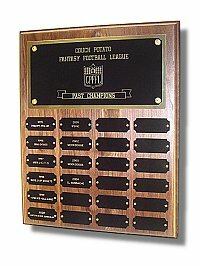 You may choose to have the title plate engraved with text only, or you may wish to select one of the several Fantasy Football title plate layouts we have available for this award! Rather than our logos, your custom logo can be imprinted in black or in full color on the title plate. Please check out the Submitting Artwork page for details! 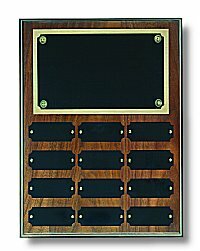 Showcase your past winners on one of our Genuine Walnut Perpetual Plaques! Our Perpetual Plaques feature black brass plates which engrave gold lettering, attached with brass screws for easy removal when it's time to add another winner. Your organization will enjoy one for many years to come.